Flavonoids and good health are linked. Science has shown that diets richer in fruits and vegetable produce better health in people. People who avoid fruits and vegetables tend to develop more health problems. A variety of reasons are proposed by the experts from fiber to vitamins. One of the links may be that many fruits and vegetables contain flavonoids, which are an important part of good health. Flavonoids aren’t difficult to get. They are also available in a wide variety of foods. You can even purchase flavonoid supplements. Often people who suffer from Tinnitus (a constant ringing in the ears) find the symptom goes away by taking a flavonoid supplement. However, one doesn’t need a supplement to get flavonoids. Including them as part of your diet through food sources is easy. You may not like raspberries but you do like strawberries. Both fruits are rich in flavonoids. Like apples, tea, or red wine? All are rich in flavonoids. Bright colored fruits and vegetables tend to be rich in flavonoids. Science has demonstrated that flavonids and good health are linked. There has been considerable research on their various health benefits. Their anti-oxidative, anti-inflammatory, anti-mutagenic and anti-carcinogenic properties have made flavonoids an indispensable component in a variety of applications and products. Researchers have also discovered they play an important role in reducing cardiovascular mortality and the prevention of CHD. Numerous studies have found a strong link between flavonoids and good health outcomes. A recent study found that the flavonoids in oranges significantly reduce your chances of developing macular degeneration. So which kinds of food contain flavonoids? There are at least 500 foods in the USDA database that are rich in flavonoids. Some of them are listed in this USDA Sources of Flavonoids chart. However, a glance at the chart will show you that flavonoids are a complicated subject. Flavonoids contain several subclasses: flavonols, flavones, flavanones, flavan-3-ols, and anthocyanidins each constituting various health benefits. If you dive into a study of them, trying to figure out what to eat, it will soon seem like you jumped into a rabbit hole. The easiest way to ensure your diet is rich in flavonoids is to consume vegetables and fruit daily. 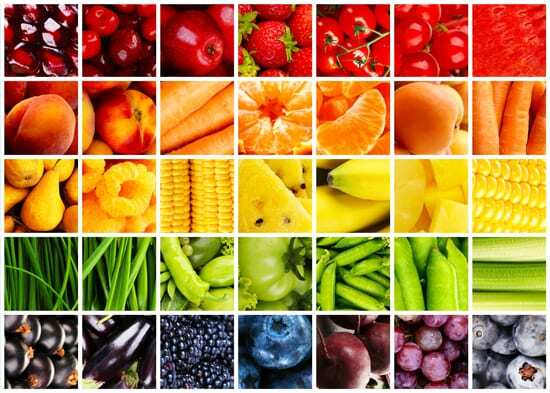 Throughout the week make sure your diet consists of a wide variety of colors: red, green, blue, orange, and yellow. It also doesn’t hurt to have an occasional glass of red wine or cup of tea throughout the week.